BRIGHT WALL SCONCE - 400 Lumens from 4 Watts of Bright LEDs. 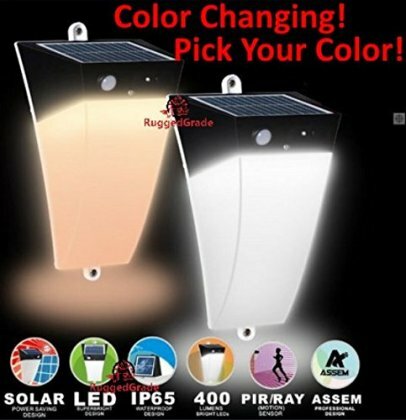 Wall Sconce can be used as Solar Garden Light, landscape Light, yard light, Solar Motion Light, Solar Sconce Light, security Light. Provides nice accent lighting on walls or fences. COLOR CHANGING LED - You choose! Pick from Warm White (3000k) or Bright white (5000K) with the push of a button. Customize the look of your backyard, front yard or wherever you choose to put it. LONG LIFE BATTERY - Premium 2000mah battery has the power to stay on longer and run for years and years. Solar Powered Rechargeable Battery. 1 Watt solar panel ensures the battery is charged quickly every day. QUALITY AND WARRANTY - CE and ROHS Certified. High Quality Design has an IP65 Waterproof rating and can be used anywhere. 1 Year Warranty.